Marilyn Wheaton is director of the Marshall M. Frederick’s Sculpture Museum in Saginaw. In this post, she reflects their Heritage Grant project, which explored history, racial inequality, and the meaning of equity through an exhibit and public programs. As a museum director, I think a lot about the quality and diversity of exhibitions we bring to the Marshall M. Fredericks Sculpture Museum, located on the campus of Saginaw Valley State University (SVSU) in the Great Lakes Bay Region. We serve 10,000 SVSU students and several counties in mid-Michigan with rural, urban and suburban residents. 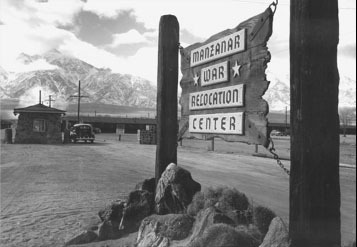 Most recently, one of the ways the museum expanded the range of its exhibits was by bringing in a traveling exhibition titled Manzanar: The Wartime Photographs of Ansel Adams. I was excited to bring the exhibit to our audiences because it presented both fine art and humanities content: photographs by one of America’s best known 20th century photographers that document the stories of Japanese American citizens during a three-year period (1942-1945) in our country’s history. In this series of images, Adams documents the internment of Japanese Americans in the United States after the bombing of Pearl Harbor during World War II, which resulted in the forced relocation and incarceration of between 110,000 and 120,000 people of Japanese ancestry. More than 60 percent were U.S. Citizens. Together, the photographs, which Adams took at the Manzanar, CA internment camp, and a lecture by Sam Mihara, a survivor who lived at a similar “relocation center” in Wyoming, that demonstrated the effects of internment to him, his family, his friends, and other people of Japanese ancestry who were forcibly removed from their homes and placed into “relocation centers,” helped audiences understand the injustices Japanese-Americans faced after the bombing of Pearl Harbor in Dec. 1941. Audiences became significantly aware of the inequities that some cultural identity groups have experienced in this country because of fear, misunderstanding, prejudice, or hatred of a particular ethnic or racial group of people. We could not have hoped for a better outcome.